When you run a food outlet, cleanliness is always top of the agenda. On the spot inspections are common, as are negative online reviews. One bad review online about your bathrooms being dirty or your floors, and your whole reputation can come crumbling down. What you need are industrial cleaning solutions from your local experts, Choice Cleaning Company in Clevedon. It doesn’t matter whether you run a small café or a large pub with a restaurant; your cleaning needs will be essentially the same. Unless you only offer cold food and never fry anything, even for bacon sandwiches, your kitchen will quickly get dirty with grease and grime. How dirty your kitchen gets will depends on the size of your operations and how busy your kitchen is, but the cleaning solutions are always the same. Your kitchen in your home gets dirty after each time you prepare a meal. A quick look at your spashback or tiles will confirm this. So, when you have a kitchen that is on the go for up to 12 hours or more at a time, it is easy to imagine just how dirty things will get. At the end of the day you will wipe your surfaces and walls, and you will periodically change oil in your fryers. What you won’t have time to do however is to pull out your fryer or hotplate, or clean the extractor fans. These tasks are something that should be left for your Industrial cleaning team. Products you can buy in the supermarket do not compare to industrial cleaning solutions. It may take you all night after you close to clean an extractor fan; your Bristol industrial cleaning experts will have it clean in minutes. Everyone that works with you in your kitchen should have an up to date health and safety certificate. They should be aware of how to store fresh and cooked foods separately, and how to clean up spills immediately. Your cleaning tasks should include wiping down all surfaces at the end of the day and inside and outside of your fridges. This should be done with antibacterial cleaning solution. Your floors should be brushed and mopped, and rubbish should be taken to the bins and never left inside or directly outside the back door. By keeping on top of your cleaning tasks, you will reduce the risk of vermin entering your premise. 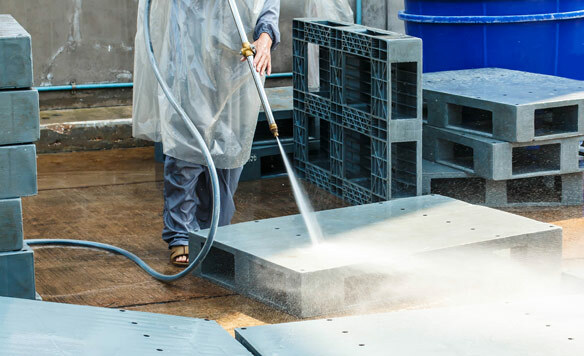 Industrial cleaning solutions on offer from your local Bristol industrial cleaning team will include annual pest control. What you need to remember is that a lot of problems you can incur in an industrial kitchen can be prevented by ensuring that everything is kept clean. Tea towels and dishcloths should be a thing of the past, and in the event that you still use cloths, they should be regularly changed and disinfected. The hard tasks of cleaning behind units and under counters and in corners are what your industrial cleaning team is for. With industrial strength cleaning equipment, your kitchen can be kept clean and ready to pass any on the spot inspection with just a couple of hours of cleaning each week.